TAIPEI (Reuters) - Taiwan's May export orders blew past expectations as the island's factories rushed to meet demand for components, such as for Apple Inc's upcoming iPhone 8, in a promising sign for global technology manufacturers. The trade-dependent economy has expanded for four quarters underpinned by rebounding exports. Even though momentum may cool in the second half, global demand for Taiwan's tech goods will bolster the economy and likely give the central bank leeway to keep interest rates on hold this week. "All major products showed year-on-year growth," the finance ministry said in a statement. "Order value from the U.S. market hit $10.36 billion, a record level for the month of May." May orders rose 9.1 percent from a year earlier, beating the 6.85 percent forecast in a Reuters poll and compared with a 7.4 percent expansion in April. The ministry said that June export order value would be higher than May. Taiwan's export orders are a leading indicator of demand for Asia's exports and for hi-tech gadgets, and typically lead actual exports by two to three months. Orders from China and the United States - its two biggest markets - rose an annual 14.5 percent and 10.2 percent, respectively. In April, they climbed 13.8 percent and 6 percent. 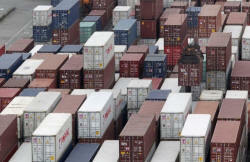 Europe orders jumped 15.3 percent and from Japan, they surged 19.2 percent. Taiwan raised its 2017 economic growth forecast to a three-year high in May, thanks to strong global demand for smartphones and other hi-tech electronic gadgets. Exports in May expanded for the eighth straight month as factories churned out supplies for Apple's new iPhone.